Need some cheap therapy? 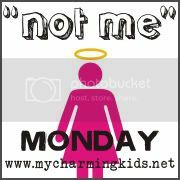 Welcome to Not Me Monday, a blog posting phenomenon created by MckMama as a way to confess everything you so did not do during the past week. This may be shocking because we all know how on top of my game I've been lately, but upon arriving in Peoria Saturday for my good friend and former roommate's wedding, the husband, newborn and I did not crazily search for the exact location of the wedding by driving around Peoria's biggest park looking for signs that would point us in the direction of the botanical gardens five minutes before the wedding was slated to begin. And when we finally found the wedding site with two minutes to spare, we did not dumbfoundedly search the empty gardens for the wedding party. And when we could not find the wedding in the location at which it was supposed to be held, we did not have to resort to finding the little old lady volunteer and inquire about where this elusive rose garden was located. And when she said the wedding had been cancelled, I did not politely demand she check the book for the groom's last name. We then were not informed that the wedding was actually Sunday, meaning I so totally did not completely read the invitation wrong at least seven times during the course of the last few months I've been planning this trip. And this error did not result in the husband I being stuck in Peoria with a newborn for a lot longer than we originally planned while I was supposed to be "resting" because I had not even hit the two-week post partum mark yet. C. I *always* put my body first and rest when I'm supposed to be resting per my medical professional's instructions. I also did not use disposable diapers this weekend solely because I failed to pack enough cloth ones. And I didn't rationalize that using the disposables was not completely against my convictions just because I managed to find organic cotton disposables that supposedly biodegrade before 400 years pass. And lastly, I did not gorge myself on hummus from the restaurant at which I used to work during college. I was not secretly a little pleased about our extra time in Peoria during which I could eat more hummus because I do not currently still have dreams about nearly everything that's on the menu four years after graduating from college. No way. Not me! Normal people do not dream about restaurants ... and I'm am so completely normal! Glad the wedding wasn't actually canceled! And that you got to eat good hummus. Yum. I had to laugh. My husband and I drove two days to his sister's wedding. When we pulled up in his parent's drive way, they looked at us funny. "You're not here for the wedding are you?" "The wedding is next week." Guess what! We didn't make the wedding, but we did get to enjoy spending time with the happy couple because they weren't running around getting ready for the wedding.